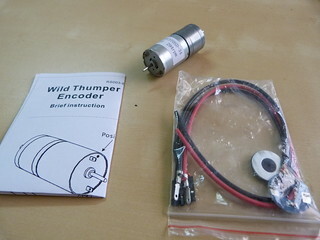 As promised here are the motor encoders for the wild thumper. 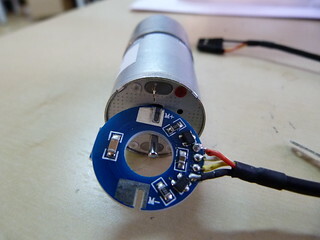 The kit has a small pcb with two hall effect sensors that are placed at 90º from each other in relation to the motor axis. A magnet ring is mounted in the rear axis. The hall effect sensors will read the angular position of this axis. The circuit board goes over the motor terminals like shown in the image. Take care to align the M+ marking over the red dot in the motor to insure the motor will turn in the expected direction. You can use just a bit of solder to keep everything together for now. The terminals have to be bent 90º so that the motors can fit inside the Wild Thumper housing. (this can be ignored for other applications). The edges of the terminal should not go outside the perimeter of the motors otherwise you will have a hard time getting then into the housing. But they should be placed close enough to the outside to allow the magnet ring to fit between them. This is a nice addition to Wild Thumper and to many other projects where accurate speed and position control is required. We should have them available for sale in our web store in a few weeks. Is this available yet? I cannot find it in the store. I have an earlier version (about 2 years old, before the encoders were introduced), will I need new motors? Do you also sell those? 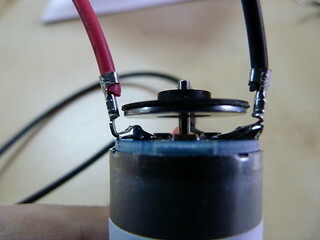 Older versions of the motors do not have exposed motor shaft to mount encoders to. The gearboxes are the same so you will get some spares. Is it possible to give the cable connections for the encoder to a arduino (digital, PWD or analogic ...) and the meanings of the values ​​of yellow and white pins ?